I'm happy to share wonderful news from our friend Ed Sanders with you! Ed worked with Leonard for many years and was also one of the key persons of The Grand Tour - he was the video producer of all the gigs and also the live releases. He has also helped our community in many ways: he made and sent us several complete, unreleased concert videos upon Leonard's request. We have screened those at our Events and the Hydra meetups. - Eija and I always looked forward to meeting him and enjoying his great hospitality during the concert days. We have so many fond memories! Well it seems quite amazing that it has been almost 10 years since the L.C. World Tour began! What an honor it was for me to be associated with it to the extent that I was. Needless to say I was saddened in the extreme with Leonard’s passing. I have taken some solace in doing what Leonard always wanted me to do - working on my own music. I have finished an album and website which has the songs, pictures and stories of Leonard and myself. I believe some of the L.C. forum members might find this of interest. 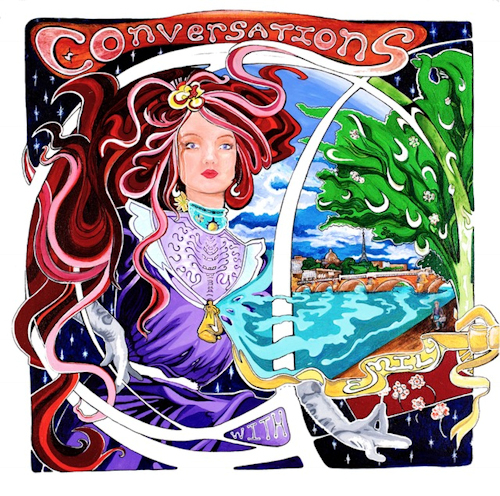 The album is called "Conversations With Emily" and in full disclosure- the music is not at all similar to Leonard’s music but is in fact written and produced to sound as if it were released in 1969/1970! Also there is a section where visitors can (for a very small charge) buy the music. I sincerely want to thank all the wonderful people in the L.C. community for making the tour experience so very special and rewarding. What recordings did you make with Leonard Cohen?? I have worked in some capacity on every Leonard Cohen record since “Dear Heather” up to and including “You Want it Darker”. I also produced and engineered Anjani’s “Blue Alert” with Leonard and Anjani as well as recording Leonard reciting Joni Mitchell's “The River”, Paul Simon’s “Sounds of Silence” just to name a few. While on tour I supervised and collected the screen/video footage which was used to make up the tour DVD/CDs that I produced and directed. Did you ever discuss songwriting with Leonard?? Yes- quite often we would play pieces of songs and go over them. I spent a lot of time (mostly before the tour) at Leonard’s house and we would both play guitar. He always wanted me to play and sing Tim Hardin’s “Reason to Believe”. I have loved that song since I heard it by Rod Stewart on the “Every Picture Tells a Story” album so I was quite familiar with it. Eventually after our sessions had ended for the day I began playing Leonard some of my recordings- he was always very, very supportive and complimentary. I vividly recall playing him something (from a collection of Buddy Holly/Everly Brothers influenced songs) that I knew the lyric was not quite right. He listened closely and then said something to the effect of- “that is a very nice song ED but there is some ambiguity in the second verse- it’s not clear what the thought is you are trying to convey”. I was busted- he was of course completely correct. I spent some time finding the proper lyrics, re-sang them, and then played it for Leonard. He said- “now it’s perfect”! I learned what I have since heard Leonard say many times- you can’t give up on the lyrics- it may take a while but it is in there. By the way the title of that song of mine- “Words in a Song”- (I kid you not!) One of the last times I saw Leonard he asked me if I had any new songs recorded. I said I had an interesting new song in the “Cole Porter” vein (“Something to Smile About”)- but it was not recorded yet. We went out into the studio and I sat at my old piano, the same one Anjani is sitting at in the picture on back cover of Leonard’s “Book of Longing” and I played and sang it. When I was done he said something like- “that was really nice- I had no idea you were such an accomplished piano player!” Of course I said- “No, no- I’m not a piano player at all! It’s just practice- I must have played this 1000 times by now!” As I put him into his cab he said to me “ED you have got to get your music out there”. So that is what I am doing - what he always wanted me to do - I miss him greatly. Sound samples are on his website, and you can buy both MP3 and WAV downloads of the album. A vinyl release (with bonus-CD) will follow in May. I look forward to hearing Ed's music.